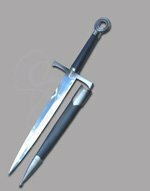 If you are looking for a basic run of the mill dagger than keep looking because this is not it. 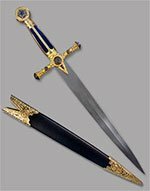 This dagger is a beautiful work of art fit for royalty. The highlight of this gorgeous pieces is a very solid pewter colored metal guard featuring an embossed decorative medieval floral pattern intertwined with shield shapes and winged lions. The pommel contains a golden colored coin insert with an embossed Templar cross. 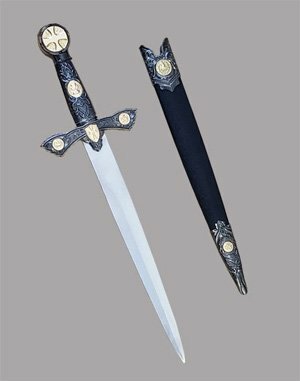 Several other golden inserts on the guard and grip add to the beauty of the hilt. Although the grip is metal it is still very comfortable to hold. 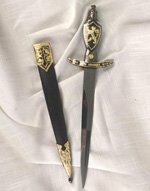 The included scabbard features a black polymer body capped on the top and bottom with metal fitting with golden inserts which perfectly match the hilt. 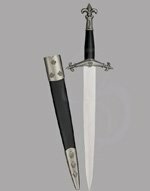 The dagger has a 9 inch blade of high gloss stainless steel. It is provided un-sharpened and makes a wonderful canvas for a custom engraving. This piece is part of the Strongblade Quick Silver line of affordable decorative daggers and swords.